Reasons why FMCG companies should seek for the optimal sales organizational structure in ME! Based on Sondos latest market research results and analysis on thousands of responses distributed within the Middle East, the impact of setting the right sales structure is obviously noted in raising the overall customer experience, loyalty, NPS scores and sales growth. Among the findings was that the best practice is having the structure of sales agent, coordinator, customer relationship manager and territory manager. The coordinator gives directions to the sales team, focusing mainly on managing schedules and the distribution of products. The customer relationship manager handles customers’ issues, follows up and ensures complete satisfaction and maximum utilization of the product or services sold to customers. The customer relationship manager will not only solve customer requests but will proactively offer ideas and insights to improve the customers’ issues and challenges. This will make each customer feel special and eventually gain their loyalty and good word of mouth to the consumers. Keeping in mind, the importance of existing a territory manager to control sales performance of the whole area. By this structure, you would have full control on sales process which pushes extremely the effectiveness and the efficiency of sales performance. As a result from this study, if you are looking for providing high levels of quality and achieving your sales target, you must not ignore the importance of setting the right structure for your sales department as a fundamental requirement for your success before looking to operation quality. 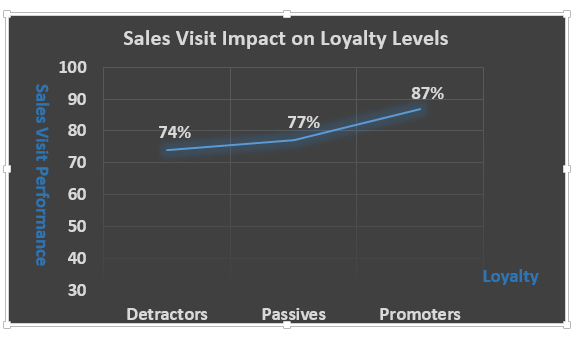 If your sales structure is poor with just sales agent and supervisor, you will lose around (22%) from the accuracy of completion the site visit process and your Net Promoter Score (NPS) will be decreased by (15%) approximately. Sondos Customer Experience Measurement and Management System (FMCG-CEMMS) role comes here to help you monitor your sales process and improve it.